This is the guide for the Good Delt. One cannot hope to become a Good Delt unless you strive to know, understand, and apply The Delt Creed in your daily life. It is traditional that all Delts memorize The Delt Creed as a pledge, but also seek out its true meaning in relations with their new brothers. I BELIEVE in Delta Tau Delta for the education of youth and the inspiration of maturity, so that I may better learn and live the truth. 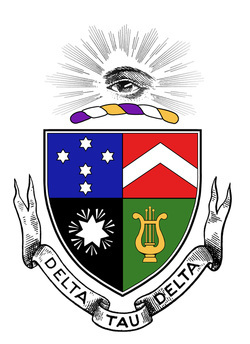 I BELIEVE in Delta Tau Delta as a shrine of international brotherhood: her cornerstone friendship, her foundation conscience, her columns aspiration, her girders self-restraint, her doorway opportunity, her windows understanding, her buttresses loyalty, her strength the Everlasting Arms. I BELIEVE in Delta Tau Delta as an abiding influence to help me do my work, fulfill my obligations, maintain my self-respect, and bring about that happy life wherein I may more truly love my fellow men, serve my country, and obey my God. Ronald McDougall (University of Wisconsin, 1964) - President, Chili’s, Inc.
Peter Buck (Emory University, 1979) - Lead guitarist with R.E.M. Ed O'Neil (Ohio University) - TV actor; "Married... With Children" and "Modern Family"
Our Fraternity has a number of symbols, each with special meaning. Each Delt pledge and member has the responsibility to know the proper use of our Fraternity's insignia. The four fundamental principles of Deltism serve as guiding ideals for our Fraternity. The significance of these ideals is explained at the Initiation into the Fraternity. The Fraternity's best loved and universally used song sprang from the prolific pen of Stuart MacLean Sewanee 1897 late one night while he was an undergraduate. It expresses with beauty the feeling of brotherhood shared by all Delts. The words and music have been learned by almost every pledge over the years. It is used to close most gatherings of Delta Tau Delta, including the Karnea Banquet. The Karnea is in itself a great Delt tradition within which many traditions are observed. The Leadership Luncheon, the Alumni Achievement Awards, and true International Brotherhood are just a few of the special parts of this greatest gathering of our Fraternity. The word comes to us from the Greek and means a "festival in honor of Apollo." Some of the Fraternity's older Songbooks record a variety of cheers and yells, including the "Choctaw Cheer" and the "Delt Whistle." This is the Delt Yell that is now most widely used. Used as grace before evening meals or more formal Delt gatherings, this invocation has become traditional in the Fraternity. Grateful for life and this daily bread. Out of our Delta Brotherhood. The Fraternity's official magazine first appeared in September, 1877, under the name of Crescent, but since 1886 it has been published under the name The Rainbow. In 2000 the name was changed to 1858 to reflect our foundation and heritage. The name was changed back to The Rainbow at Karnea 2000. Issued quarterly, it contains Delta Tau Delta news, articles of general interest to Fraternity members, undergraduate chapter news, alumni notes and special features.